You may have seen my review, also launched today, for Kandoo Flushable Wipes, which are fabulous for potty training your kids and for little messes BUT did you know that Boogie Wipes recently partnered with PampersKandoo!? As a result, I have been given the chance to review a couple of packs of Boogie Wipes this week as well as the Kandoo Flushable ones and so my household just got even fresher!! 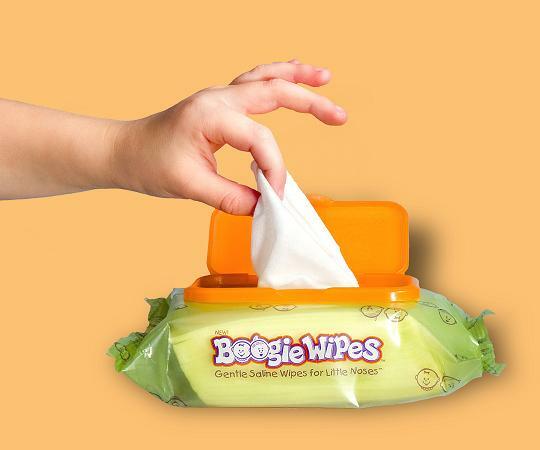 Boogie Wipes are soothing, saline wipes designed by moms for runny noses, which often get red-raw and sore when a little sniffling and a lot of cold come into play and these wipes keep those noses clean and comfy with a moist wipe instead of using coarse tissues! Available in various different scents in increments of 10, 30 and 45 count packs or 90 count canisters, these are made to be accessible in the home or on the go and so you never have to worry about a runny nose again and no more ouchies with all that rubbing, sniffling and sneezing! Just pull out a wipe, freshen the face and dispose of responsibly! I found that these were great for us this past week with dirty faces and allergies still in the air with the high humidity and temperatures bumping themselves back up to the 90s for a moment there! The wipes really are soft and have a nice smell about them and I especially loved the grape! The packaging looks fresh and they are easy to open, close and store away and best kept out of the reach of small children who tend to find wipes fascinating as I mentioned in my previous review! I found these just as useful on my own face as I did my children's, especially with my own allergies kicking in to give me one last ride before we stumble upon fall! I certainly appreciated the gentleness of the wipes and didn't find them overpowering at all - in fact, I think they will come in very hand during the upcoming flue and cold seasons and I am definitely going to grab myself some more! If you would like to find out more, and perhaps pick some up for yourselves then you can head on over to the Boogie Wipes website and see what they have to offer, HERE! If you love what you see, then you can also keep up to date with Boogie Wipes on TWITTER and FACEBOOK, too! So why not stop in and say hello!! How would you like to try these out for yourselves for FREE!? Well, ONE lucky reader is about to be able to do just that with this fabulous giveaway, which will run until Sept 29th, 2013! ONE winner will win 2 packs of Boogie Wipes (30 count each) in 2 scents of the suppliers choice and will be directly shipped to the winner! Winner will be chosen from the rafflecopter and notified by email so please enter with a valid email address so that we can contact you! You will have 48 hours to claim your prize before it becomes forfeit and a new winner is chosen! Open to US, Canadian and Australian entrants only, please! 18 or older to win or ask for your parents permission to do so! - Mom's Gone Bronson is not responsible for prize fulfillment. Please, go ahead and enter via the rafflecopter below, enjoy and GOOD LUCK! Disclaimer: I received products free for the sake of this review! My opinions are honest and my own and yours may vary and/or differ! Thank you! Saline wipes have been great for my sensitive dry nostrils and blowing my nose all the time! Love Boogie Wipes! They're a staple at my house! I have never tried Boogie Wipes but think I will now. Thank you. The Grape does smell amazing! I love boogie wipes! Except for my 3 year old thinks they smell like candy and likes to stick them in her mouth lol "adult supervision required"
with two children in elementary school and a 4 month old I could definitely use these in my house. Would love to win these and grape smelling sounds much better than the regular.... as long as they aren't sticky. I entered the boogie wipes and kandoo giveaways! Great giveways! We are always dealing with sticky hands.. Thanks!